BONDED and INSURED – we accommodate your building documentation requirements. 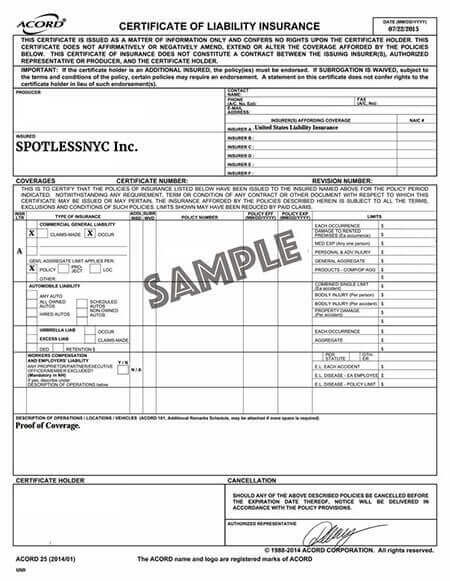 Dealing with building management companies is a daily occurrence for us at SpotlessNYC, and we know what most of the requirements are. Recognized for our high operational and safety standards, and experienced throughout the city and boroughs – we can satisfy many and all the guidelines associated with rendering our cleaning services to the residents of NYC. We can deal directly with your management company, or with you personally to provide any documentation needed to cover the lawful requirements and provide hassle-free service.